Tarpon are blue-gray on the back with silver on the sides and belly. The fins are dusky or pale. They are easily identified by their large scales, their large mouth (which points upward) and their small dorsal fin that has an elongated ray. These combined characteristics separate Tarpon from their closest relatives, the Ladyfish and the Bonefish. Tarpons feed on crabs and fishes such as sardines, anchovies, mullets, silversides, hardhead catfish, and Atlantic cutlass fish. Tarpons are found from Nova Scotia south to Brazil, including Bermuda, Gulf of Mexico, and Caribbean and infrequently north of North Carolina. The preferred habitat is coastal waters such as lower rivers, passes between islands and mangrove-lined lagoons. 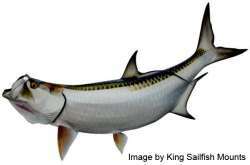 Tarpon average 40 to 50 pounds and 65 inches but may reach up to 350 pounds and 8 feet in length.